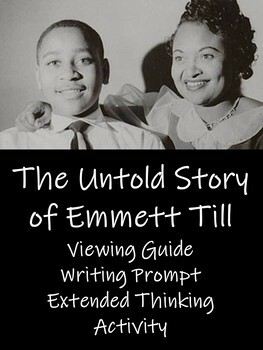 The Untold Story of Emmett Till is a powerful documentary about the tragic murder of a young African American boy. 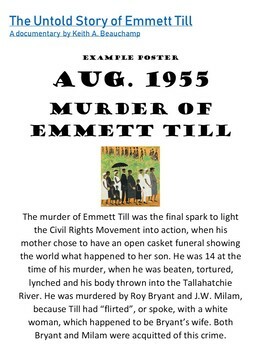 His mother's brave decision to have an open casket, and show the world the treatment of African Americans, is credited with sparking the Civil Rights Movement. 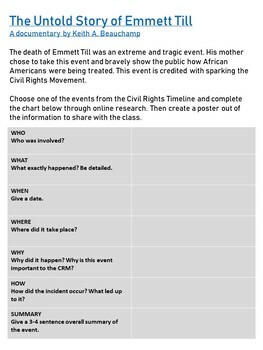 This viewing guide contains 21 viewing questions, a writing prompt asking students to give evidence from the documentary, and an extended thinking research project on famous Civil Rights events. 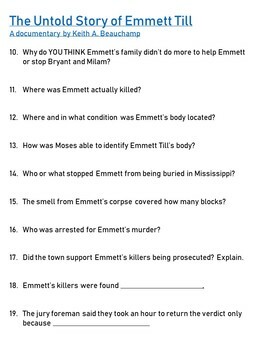 Great to use in February or any time you are discussing or reading literature from the Civil Rights Era.